There's been on and off talks of having a Grand Prix in Cape Town, South Africa for a couple years now, but nothing ever happened. I've had enough of getting my hopes up, and I've decided to do it myself. I've never made a mod for rFactor, let alone an entire track, so in all likelihood this will never get quite done. But I'll give it a go nevertheless. 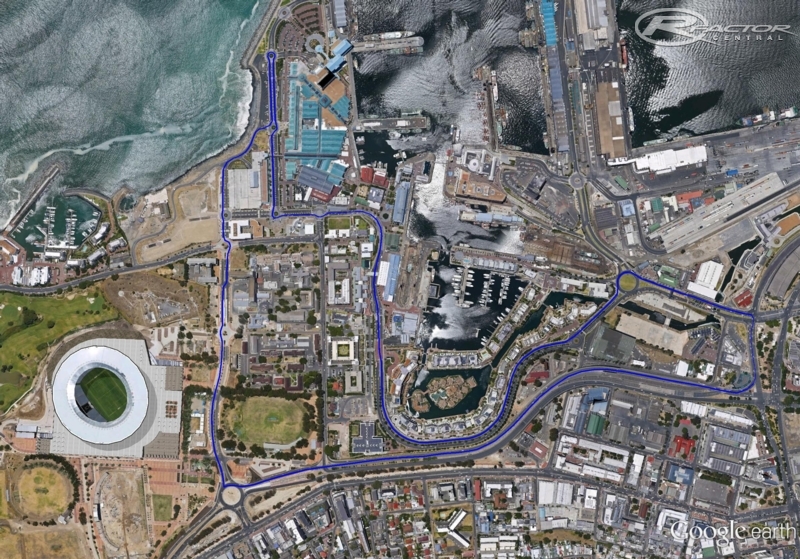 The circuit runs through the glamorous Waterfront in CT, making it the Monaco of Africa (I can do ad-speak). It goes past the Cape Town stadium (built for the 2010 Soccer WC), twisting it's way through narrow streets and chicanes before turning around and blasting through the V&A waterfront. It loops around, past the Cape Town International Convention Centre, past some fancy hotels and stuff, then underneath the famous unfinished highways, then climbing up onto the freeway and careering back onto the start finish straight. All in the shadow of the world famous Table Mountain. Unfortunately, it's probably not going to be quite as great as all that. I've never done anything like this before, and currently I'm fumbling around a bit. I have mapped out the circuit, based on Google Maps and real world experience, and the basic shape is there. Most of the work is now going to be making it look less crap. Have finished mapping out the track and am now busy adding scenery and such. Am struggling a little bit with terrain and road textures, particularly the fact that the road surface is supposed to change occasionally from tarmac to cobbles, and also how to paint traffic lines on the road as well. I am from Cape Town. I have atrack designer who can assist you with this if you need assistance. Dont worry, the credit is all yours mate. Please contact me so we can help getting this track published!! Hi mate. i am from Cape Town, South Africa but i live in New Zealand and i was curious as to when roughly this will be released and also if you know of anybody who is making a durban street circuit which hosted a few A1GP rounds?